Conditional Checkout Fields – show/hide fields based on value of other checkout fields. Show fields Under My Account/Edit Address Page. Show submitted field details in order edition page. Show submitted field details in order emails. Show submitted field details in order conformation and view order page. 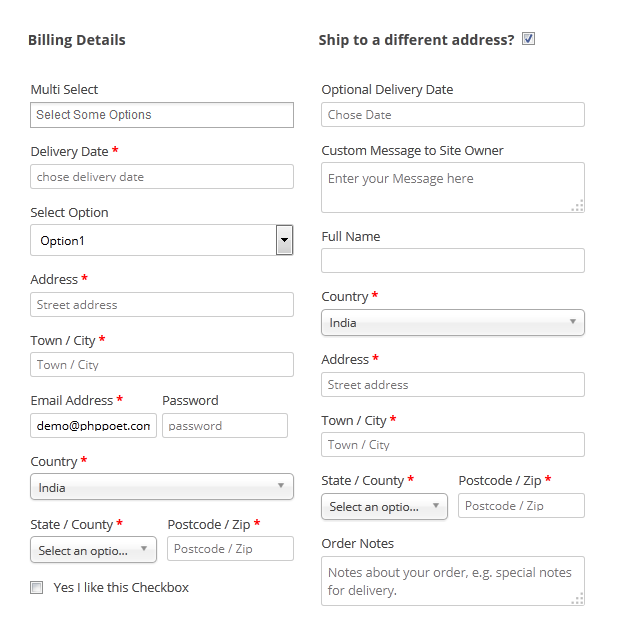 Show submitted field details in WooCommerce PDF Invoices & Packing Slips invoices. Show/hide checkout fields based on the value of other checkout fields. Display fields only if cart contains specified products. Display fields only if cart contains products from specified categories. Note:- Changes to core address fields like country,state,zip are locked in from woocommerce as lot of other core functionality is dependent upon them. It will not be possible to make changes to those fields using this plugin. Version 1.7.1(21 march 2019) – Fix-billing state required notice for EU countries. Fix – Reordering fields not working. Fix – Debug notice related to fields priority. Version 1.6.2 (22 may 2018)- Fixed bug related to previous update. Version 1.6.1 (22 may 2018)- Fixed debug errors. Replaced chosen with select2 in backend. Replaced existing product multiselect with ajax multiselect. Removed Purchase code field in settings section. Fix – minor admin side bug. Fixed WooCommerce 3.0 compatibility issues. Removed plugin update library. Use http://envato.github.io/wp-envato-market/ instead. Version 1.3.5 (04 october 2016)- Replaced comma,space with pipe,space as separater in options field. Version 1.3.4 (27 september 2016) – Fixed bug with Extra CSS section in newly added billing/shipping fields. Version 1.3.3 (24 september 2016) – Changed plugin update notification text. Version 1.3.2 (22 september 2016) – Fixed lowercase issue with select options on backend. Version 1.3.1 (18 september 2016) – Manage fields under My Account/Edit Address page, Added Extra CSS option for each field,Show fields data on view order and order confirmation page. Added – Conditional field specific visibility to hide/show fields based on value of other fields. 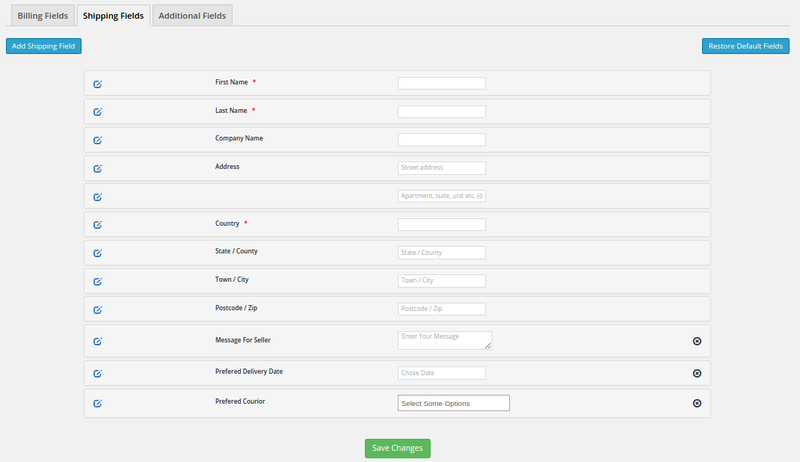 Added – Showing submitted field details in WooCommerce PDF Invoices & Packing Slips invoices. Added – Tag editor for select,multiselect,radio options. Added – Three new field type : Email , Telephone and Number. Removed – Validate on additional fields. Fix – Jquery drag and drop conflict issue. version 1.2.6 (31/08/2016) – Overrides core woocommerce radio field html on checkout page. Version 1.2.5 (24/08/2016)- Fixed bug with select2 placeholder. Version 1.2.4 (04/05/2016) – Added default po/mo files. Version 1.2.3 (29/02/2016)- Fixed issue with WP Multisite. Version 1.2.1 (07/11/2015) – Fixed 2 bugs related to 1.2.0 update. Improvement in orderedition field display. 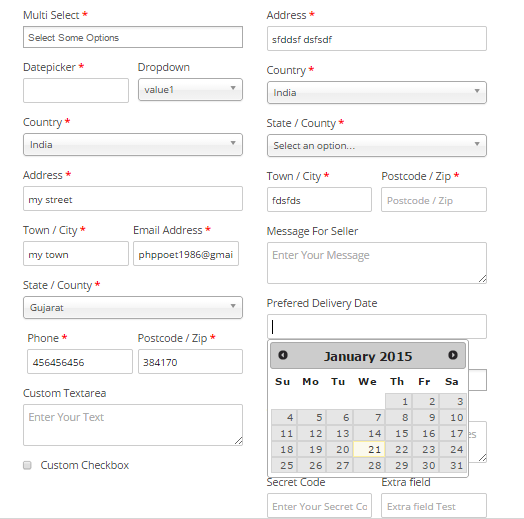 Separated option for orderedition fields and order email fields. 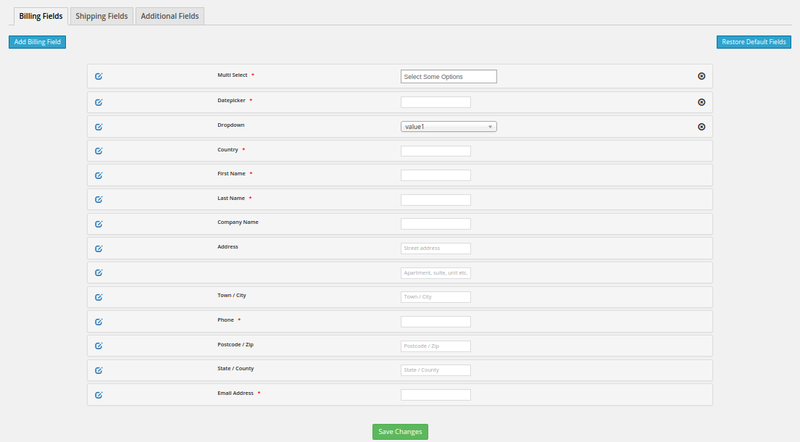 Added category and product specific field visibility. Version 1.1.1 (20/10/2015) – Some changes in automatic plugin update code to improve performance. 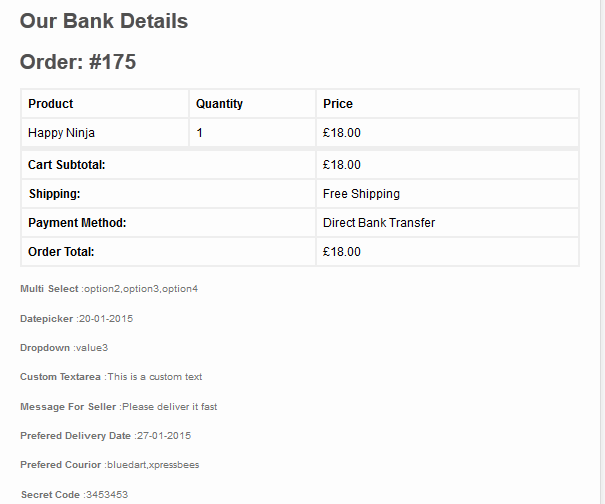 Fixed bug related to order email fields and paypal payment gateway. Fixed debug error related to datepicker field. Disabled label change option for core address fields. Improvement in automatic plugin update feature. Added direct update within wordpress dashboard. Fixed bug related to required validation. Replaced chosen with select2 on frontend. Backend still uses chosen. Fixed compatibility issues with woocommerce 2.3.3. Added option to disable selection of past dates in datepicker. Fixed bug that shows wrong field key for additional fields. Fixed bug related to shop manager role on order edition page. Fixed bug related to datepicker arrows. Displays array into comma separated string into order edition page. Fixed bug that prevents additional fields display on order edition page. Fixed bug related to additional fields required validation. Added less opacity for hidden core fields. Minor tweak in backend css and js code. Major Change/Improvement on Admin side as well as frontend side code. Verified functionality of all features.